Attention Arma Fans! High command sends pleasantries for the coming weekend! Rally the troops, check your gear and get ready to play. Arma 3 is free to play on Steam this weekend only! Starting Thursday, April 26 up until Monday, April 30th at 19:00 CEST, everyone can play the complete Arma 3 base game on Steam for free. To install the game, Arma 3 will be temporarily added to your Steam Library, or you can install the game via Arma 3's store page on Steam. Here at Nitrado, we have a Three Day option! Why not play your favorite Military Sim on your very own Game server? Try out ARMA 3 and try your very own game server! Rent your Own Arma Server at Nitrado.net Today!! Along with the free weekend, if you like the game and choose to buy it, pick up Arma 3 and its DLC with discounts up to 66%! Discounts are provided for the base game, as well as all mods excluding the new "Tanks" DLC released recently. So be sure to check out the Arma 3 store page even if you already own the base game. Arma 3 has come a long way since the release in 2013. With an average playtime per Arma 3 user of 150+ hours, 50,000+ public Steam Workshop items, and over 57,000 registered Units. The beloved Arma 3 platform has received over 75 free platform updates. With newer content, features, and a lot more; Arma 3 is in the best shape it ever has been! 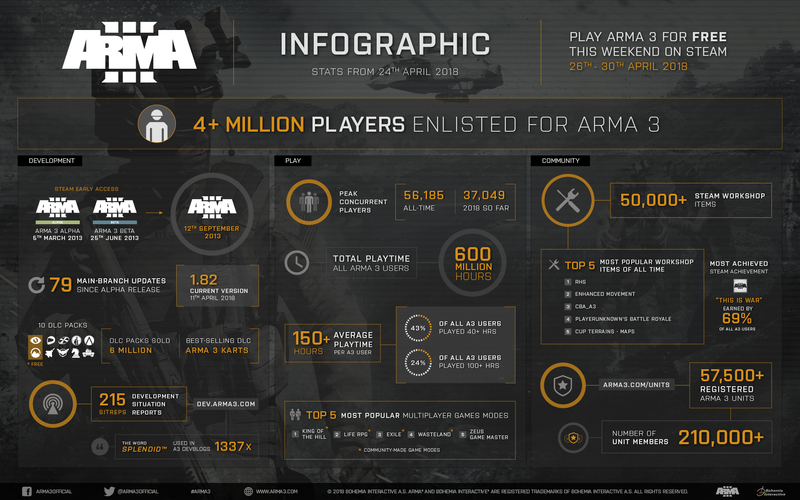 Check out the developers new infographic poster for a quick overview of Arma 3's development from 2013 to now!